Ahh, one of the age old questions. They say that you should dress to impress, so how do you know how far to go in terms of impressions? I always worry about looking too overdressed or too underdressed in new situations, especially because I don't want to stand out, but I also want to make a good first impression with my outfit. Clothing can say a lot about a person, but how do you know how dressed up you should look on the spectrum of "lazy day" to "meeting royalty?" 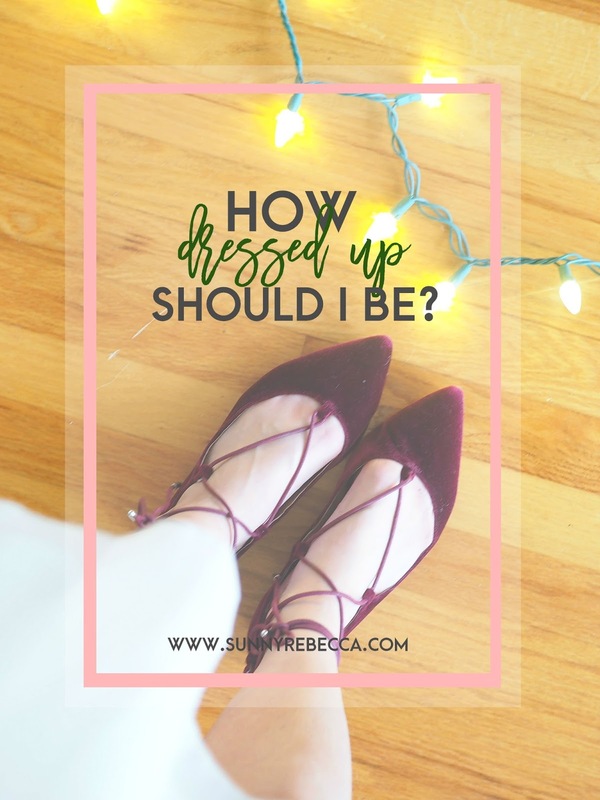 A lot of the times, you just have to think it through and just guess, but wouldn't it be easier if you had a guide or a cheatsheet to help you figure out how dressed up you should be? Anything that screams "J. Crew" should probably do it! Depending on the job that you're applying for, it may differ, but the go to interview look is probably either a dress or a top and pencil skirt with a blazer thrown over it. You can range anywhere from business casual to business formal, depending on the type of job that you're applying for. The main goal is to look put together and appear professional. I would try to look at the company culture to guess the level of formality that you should carry in your outfit. For example, a job with a prestigious law firm might call for business formal, while a trendy start-up company might call for business casual. Where to shop at: Try Loft, Limited, Banana Republic, or J. Crew. It depends on what prior relationship you have with your date as well as where you're going, but the safest look would be a dressy, casual chic look. Go for a casual dress, a skirt, or a nice top. Try to ask where you're going on the date before, like if you're going to a coffee shop, dress down. If you're going to a restaurant, go for the dressy look. I've created a basic cheatsheet for the kinds of things that you should wear based on the type of date. Go for stylish yet casual. It's a look where dressy meets casual. Wear clothes that you feel good in, not only confident, but also comfortable. Don't be afraid to wear some comfy shoes, like sneakers, maybe Converse or Keds if you want to be comfortable and look stylish. The look for house parties is a balanced look, you're still looking cute, but you get the best of both worlds, because you're comfortable too. You guessed it, it's that time that you can rock a gown and feel like a princess. Your dress should be full length and you can feel free to accessorize as much as you please. Honestly, I didn't know the difference between black tie and white tie, mostly because I haven't had any events that have ranged in that dress code, but there's only a small difference. For women, both would include formal full-length dresses. The main difference is that white tie is the highest level of formal attire. For men, the clothing differs more between white tie and black tie, black tie might call for a tuxedo with a bow tie, while white tie would call for white bow ties, dress shirts, coats with tails, and vests. Where to shop at: Try Nordstrom, Saks Fifth Avenue, Neiman Marcus, Lord and Taylor, and similar shops. If you're looking to save money, rent a dress on Rent the Runway. Your best bet? Ask the host (if there is one) what he/she is wearing for you to get an idea of how nice you should dress. However, sometimes we don't always have the option of asking, there may not be a host (it may be some other kind of event), or are just too nervous to ask. If worse comes to worse, take some of these clues to try to piece together the kind of clothes that you should wear. When in doubt, go for the casual chic look. It's somewhere in the middle so that you'll either be a little overdressed or a little underdressed, not standing out completely. Whatever you wear, make sure that you feel good in it. You feel confident in it and feel the most you that you can be. I believe that fashion can totally change your perspective and mood, make sure that you're wearing clothes that channel a great perspective. If clothing says a lot about a person, then what you wear should channel you and your personality. This post was seriously so helpful!! I always worry about being too dressed up or dressed down so I will definitely be using this as a reference. This post is ridiculously helpful! One of my worst nightmares is walking into some kind of gathering in the wrong ensemble (and unfortunately, it has happened before); I'm definitely referencing this post for tough situations! It's definitely one of my worst nightmares too! Glad that this post could help you out! I have referenced this today, and it totally saved me on a movie date with my friends! I'm the kind of person who would wear a dress to a movie theatre, and get made fun of since it's a movie date. This is another one of those posts from you that I totally love! Good Work! AHH I'M SO GLAD IT WAS HELPFUL! This has always been such a struggle for me, but I love how you broke it all up! Super helpful! !